Are you searching for an auto repair shop near New Haven and Wallingford? 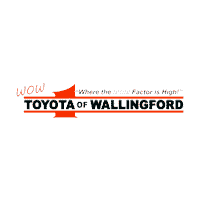 For low prices and expert service, turn to the WOW Toyota of Wallingford auto repair shop. We have helped thousands of customers throughout the state of Connecticut with all their automotive service and repair needs. From a basic oil change to a more serious electrical of drive train repair, our service technicians have you covered. While we are highly trained on all new Toyota and used Toyota models, we also have years of experience working on other brands. Don’t risk bringing your car, truck, or SUV to a lesser quality repair center! We are located at 859 N Colony Rd in Wallingford, CT, just minutes away from New Haven and Bristol. You will be pleased to discover that the parts and accessories we use are OEM certified. By using only OEM Toyota auto parts, you can be sure all repairs performed here will last you for years to come.